To get the most out of Davis Assistant, you must have at least one host that&apos;s running at least one monitored application. If no hosts are currently monitored in your installation, please follow the steps for OneAgent installation. 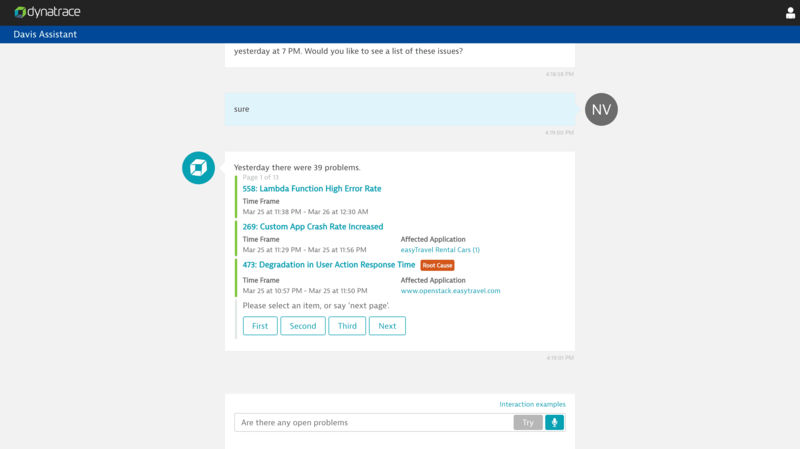 You must be a Dynatrace administrator to add or modify an environment in Davis Assistant. Managed environments must be manually added. Go to https://davis.dynatrace.com. If you haven&apos;t done so already, sign in to your Dynatrace SaaS or Dynatrace Managed account. Interact with Davis Assistant using the text input or the Microphone button. For tips on interacting with Davis Assistant, click Try at the bottom of the window. Next, you can enable Davis Assistant on Alexa, Slack, and Google Assistant.